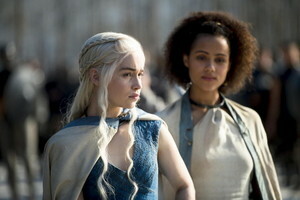 Daenerys Targaryen & Missandei. Season 4 photo. Wallpaper and background images in the Daenerys Targaryen club tagged: dany daario game of thrones photo season 4 show scene character. This Daenerys Targaryen photo might contain outerwear and overclothes.